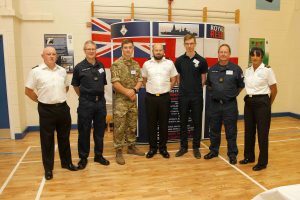 HMS Forward, Birmingham’s Royal Naval Reserve Unit, held a ‘Bring your Boss to work’ event on 9th October. They held the event at their training centre in Birmingham. The event was well attended by Reservists and their Managers and colleagues who joined them to learn more about the Reservists roles outside of their day jobs and increase the Managers understanding of the benefits Reservists bring to civilian organisations. 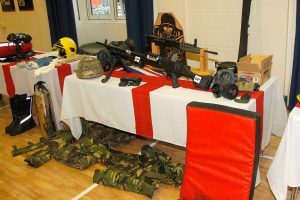 The evening hosted presentations from Reservists who had recently returned home from operations overseas and a presentation from West Midland RFCA who spoke about the Armed Forces Covenant and Employer Recognition Scheme. Following the informative presentations there was a buffet supper and the opportunity to chat to other attendees. If you would like to find out more about the Armed Forces Covenant or Employer Recognition Scheme please contact West Midland RFCA’s Employer Engagement team on wm-eeao@rfca.mod.uk or 0121 274 2227.